Improving the legal and regulatory environment related to housing and increasing the supply of affordable, legal shelter with tenure security and access to basic services and amenities is one vital component of any strategy to end extreme poverty and improve living conditions for the urban poor. The pace of urbanization and the number of people living in urban settings has increased exponentially over the course of the past century, with more than half of the world’s population now living in urban areas. 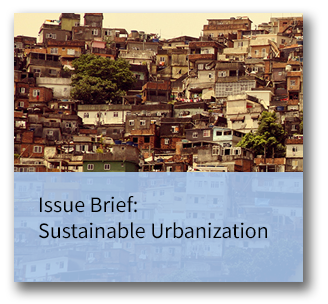 And the urban slum population alone is projected to increase to 2 billion people by 2030 (UN 2003). Urbanization is driven by the concentration of investment and employment opportunities in urban areas. In these areas, secure tenure is a necessary condition to improve access to economic opportunity, including livelihoods, credit markets, public and municipal services. When tenure rights are insecure people have reduced incentives to invest in and upgrade land and housing; they may be forced to leave a family member home to guard property rather than work or go to school; and, they may often lack access to services to devote significant portions of their time and income to acquire these. Given the complexity of urban land tenure and property rights and the limited capability of government at national and local levels to meet the increasing challenge, no single form of tenure can meet the diverse and changing needs of large urban populations. Additionally, in many countries, urban tenure systems are different from those in rural areas. It is therefore important to consider a range of pragmatic approaches to improving tenure security and access to public services. Secure land tenure and property rights are the gateway to achieving many of USAID’s development goals in urban areas.